There have been some tweaks to the service since it launched as I outlined in this article. You won’t be getting the ‘3 in 1’ bread roll in the photo below for a start! If New York JFK is anything to go by, you can expect a potential three hour meal service as crews get used to the new system although it should accelerate as the weeks go by. Air China has brought back its annual German super-sale weekend. I have no idea why Air China offers such low prices for one weekend a year but it does offer exceptional opportunities. Full details are on the Air China German site here. Prices are astounding, although I have no experience of Air China’s business class seat or service and I recommend doing some digging before booking. For the money, I doubt you can go far wrong. As a member of Star Alliance, you can credit the flights – as long as the relevant booking class is valid – to Miles & More, United MileagePlus, SAS EuroBonus, Singapore Airlines Krisflyer or one of the various other options which are easier to operate than Air China’s PhoenixMiles scheme. OT: I read in the comments last week as a platinum you can send a referral for the BAPP, but tried to find the link yesterday but couldn’t get it to work. It might be because I was using an iPad ! Do you mean not working at all Yuff, or you cannot find the BAPP? I just checked for you and it’s working fine on my android. If you are having difficulty finding BAPP, click on ‘view our other cards’ on the platinum invite, scroll down to the picture of platinum and gold card, above that click on link for ‘credit cards’ and it brings all cards up that can be referred including BAPP. Probably been asked a nauseam, and if so, sorry – but is it a flat 18k MR per referral? *Ad* nauseam. Yeesh, Saturday mornings with kids. I have been approved for the BAPP but my husband who referred me from his plat hasn’t seen the points yet. Do these only post once card is activated? Amex seems to be posting points more slowly recently. Seems to be more like a week for them to go on. I have done quite a few SPG’s for my wife for readers recently but only two have hit. Referral points normally post just before the card is received. I had some issues with my new card not arriving and had to phone up the new accounts team. While speaking to the Amex Rep he claimed that referral points will only be triggered once the new card welcome bonus spend has been achieved. Not sure if anyone else has heard this? Anyway wasn’t entirely certain he knew what he was talking about as he seemed to think you always needed to spend of the new card first to activate referral bonus, thought it might be an interesting reference point (as an aside we were trying to refer from Plat to BAPP, will update if it doesn’t work). I think someone said the other day that Adblocker on iPhones partially blocks the page, including the BA cards section. So just disable for a minute and you should be able to see the full range of cards. Bizarre! I recall earlier in the week comments about 3000 MR pts for taking out a supplemental amex gold card. There were mixed success rates. I spoke to Amex via chat who confirmed that there was currently no bonus. Applied anyway and points posted within 24 hrs! 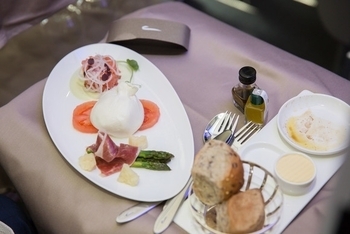 With the new Club World food and Economy selection, is there anything we know that has been changed for Premium Economy? I’m flying BA to Newark soon and wondered if there will be a change? Seems strange to upgrade Economy and Business but not Premium Economy?! There isnt much difference between them and the food used to make a difference! Changes reportedly coming on WTP soft product but not until late in the year. I can understand food trials etc but it’s beyond me how they need to drip-feed changes in food that are ordered and supplied on a tray, blankets and pillows thst can simply be switched, and so on. JamesB. Do&Co are the caterers for the new CW meals. Until the outstations are fully up to speed and have the facilities to handle the new catering it’ll continue to be added route by route. I won’t get to try it. Got CW booked to return from Toronto to LHR in May but it’s thd sleeper service. Got F booked on the outbound. All on the 241 voucher. Tilly, I’ve also got the return booked from YYZ to LHR in May in CW. Sunday 12th I think. I’m on the Sunday flight back too. 13th May. 10pm or something like that. Whichever is the sleeper service. Also anyone flown AA new premium ? I think there are two versions of CW seats but I don’t know how they differ between aircraft. The versions are much the same, I think the newer version might just be an upgraded old seat in most cases, new upholstery, added sockets etc. I had a CW seat on my last flight to KUL which was much more comfortable than usual so I think that was one, and it did make a difference. The 744s are being retrofitted, or have already been so, therefore you can likely expect newer psoducts. I am sure others will confirm, I have not had the pleasure of flying a 744 for several years now unfortunately, I would take it over a 777 any day. The BA 747s with the smallest economy cabin have the newer IFE installed so presumably they’ll also have a newer version of the seats. It’s the flight were main deck club goes to row 22 and WTP is rows 33-36 and economy starts at row 40. Indeed, see below. It was the new layout when I booked, but at checkin it changed to the older type. As I checked in on the app, I saw my 34E morph into 14E. For a joyous moment I thought I had been upgraded – but that dream rapidly faded as I realised we had been switched to the older aircraft. There are at least 2 standards of 747s in the BA fleet, with some pretty old. Did a return to the ME recently on aircraft with the WTP section immediately behind first, and they were poor both ways. We had the old seats in WTP with IFE screens little bigger than a smartphone. As for movies, there were about 20 recent releases, but the so-called ‘movie library’ had 6 movies. CW on the way back was in a similar aircraft fit – bigger screens than in WTP but old and lo-res and with the same limited choice. On the other hand, both ways last year to S Africa were on much newer aircraft with big hi-res IFE in CW. Can’t say I noticed any major difference CW seats themselves though, apart from tiredness. In fact the layout changed between seat selection and checkin, so I guess there had been an aircraft change. Biggest variable seems to be the crew – if you get a good worldwide crew it can be very pleasant. OT but I’ve got a 2 night work stay coming up ata Hilton. If I check out after the first night will it class as 2 stays and therefore incur 2 x 2000 points in the current promo? No. Not even wortwhile trying it and chasing up with CS, they take a tough line on this and similarly if mixing award and cash nights. If there is another Hilton nearby then switching hotels gets round the problem. Thanks both. Will I get the bonus points and any status benefits if work books it for me on a corporate rate? Yes, usually a normal corporate travel agent. I fly to Hong Kong in Club on 6th Feb but have a special meal ordered – any idea how that will work with the New meal service? Will I just get mine first, since I won’t be choosing from the trolley? OT: Reposting this as asked the question a bit late in the day yesterday. I will be going to a conference in Miami in April and can either stay in the JW Marriott Marquis or the Hotel Beaux Arts, Autograph Collection, which is the top floors of the Marriott building as far as I can make out. I’ve stayed at the JW Mariott in downtown Miami and it’s excellent. (I thought it was much better than the Conrad which was very disappointing). Think I’ve spotted why these Air China fares are such good value….the connection is longer than the 1st sector! Yes, Air China often pops up on OTA as the cheapest option until you realise transit in China can be horrendous. One example on the return is getting to China a few hours after the connecting flight for the day has gone so you have a 20hr wait!!! OTOH the least jet lag EU-NZ I’ve found is an overnight in China with time for bit of sightseeing and sleep in proper bed then on to NZ next morning. Flying to IAD in August so looking forward to sampling the changes. CW makes for such a great start to a holiday, thanks to HFP these days I get excited about the travelling instead of having to grit my teeth and wish away the hours till we get to our destination ????. Totally agreed, also flying to IAD in May and the journey is now such a joy since discovering HfP and the opportunity to fly in J. Secretly crossing fingers for F to open up for the outbound. Flew LHR to JFK yesterday in CW. The food was a massive improvement. FA encouraged us to have a few starters and desserts. I had two starters and the sweet corn soup was fabtastic. I could only manage one pud, but my brother did have two. Afternoon tea was very well presented, no more sandwiches ‘still in the wrapper’. My only wish is to get rid of the Castlenau. I had 2 desserts at a restaurant last weekend. The waiter was amazed. I think it’s a new trend for 2018. If you can’t choose, have both! Great, I’m of to HK in CW in May, looking forward to it even more now! If they could just change the blankets as well……! I also think it takes time to change the meal service because there are existing contracts in place and they have to run their course. OT: Off to Antigua in May and have realised I need to renew my passport as it won’t have the required 6 months validity. Does anyone know if you can use Amex to pay for it? Potentially at the Post Office using their check & send service? I would have thought you can use it at the post office. Very envious. Husband and I loved Antigua when we were there in November. Wish I was still there. The helicopter tour to Montserrat was fab! Also really enjoyed the catamaran trip round the island. Had a tour of the island by land and whilst booked onto a small group tour ended up with private tour which was just amazing! Just to confirm – no chance of anything exciting on the 380 to Singapore early March? Not even new amenity kit, pillows or food? Proving a hard sell to the wife! !